A section of a much larger formation of Arquibussiers de Grassins protect the extreme right flank. A river, lake and a densely wooded hilly area are off image at the bottom. 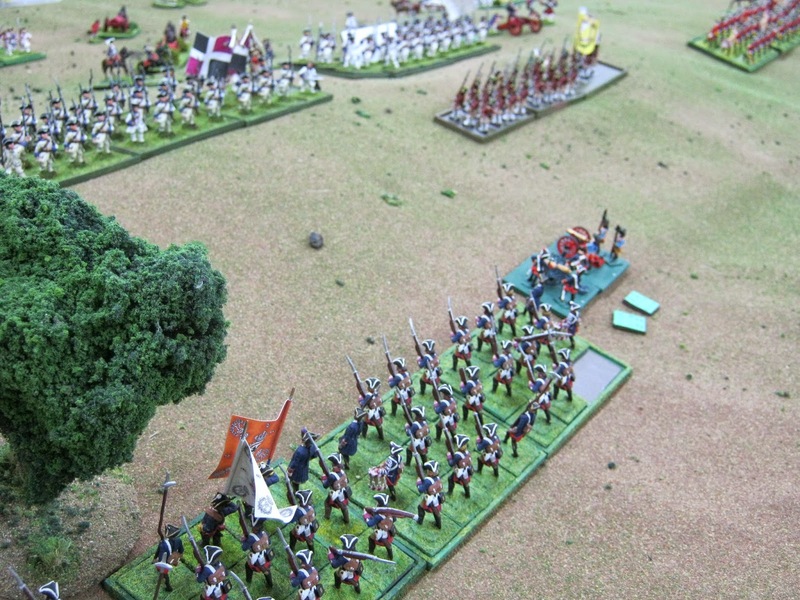 Régiment Auvergene's two battalions stretch into the distance where they meet a battalion of Languedoc. We've turned around looking the opposite way. Languedoc is at the top of this image. Berry is at the bottom. In front of the horsemen of French Commissaire Général is a ridge. 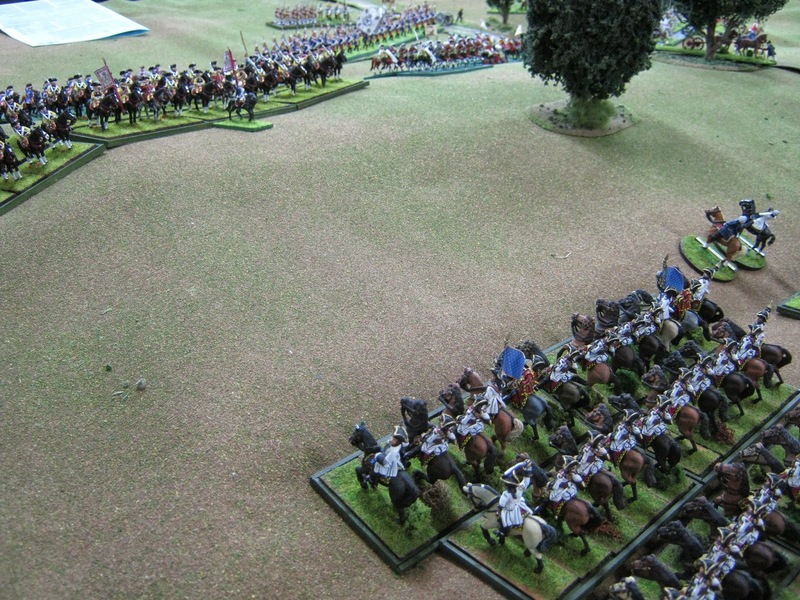 Not shown is another body of French horse; three squadrons of Royal Carabiniers off image to the right. Aren't SYW uniforms lovely, elegant and stylish? I've thought so for more than four decades. Click on all images to enlarge the view. The Karabineers are at the top center here. 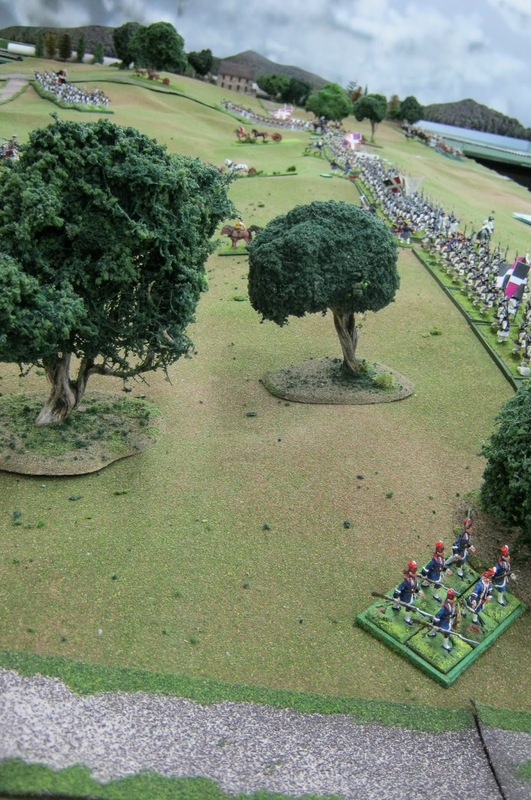 Out there with them from Hanover are horsemen of the Guards (red), von Bremer (nearest the big tree) and von Breidenbach's Dragoons. Behind them is the Hessian Leib Regiment. 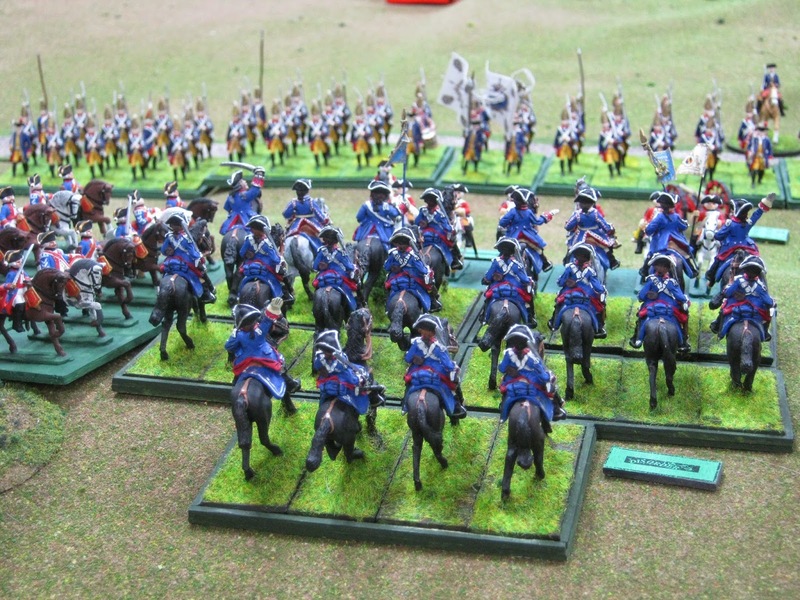 Somewhere out there is a body of Luckner's Hussars. I can't see them yet. 118 cavalrymen and they outnumber the French who have only 72 riders --- but all of them are wearing the cuirasse today. Should we talk about Allied infantry? Yes! 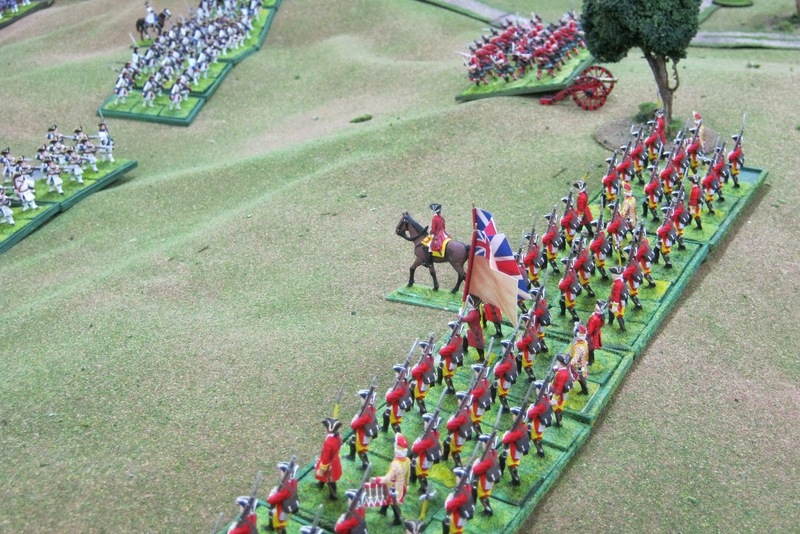 Before you is a Converged Battalion of Scottish and British Grenadiers. To their right rear is a smaller body of Germanic Converged Grenadiers. The unit with white flags is non other than the Potsdam Guard Grenadiers - no - the Protzdam Guard Grenadiers. I guess the Allies are serious on their right flank. Their deployment looks marvelous. Well done. That's Auvergene's two battalions again opposed by von Bungle of Prussia and the newest Allied unit, von Spörcken from Hanover. Their flags are from a company new to me. Maverick Models. I like them. Of von Bungle refusing the extreme Allied Left Flank as von Spörcken advances forward engaging 1/Auvergne. The small cannons are four and three pounders from Brunswick and Hanover left to right firing at 2/Auvergne. 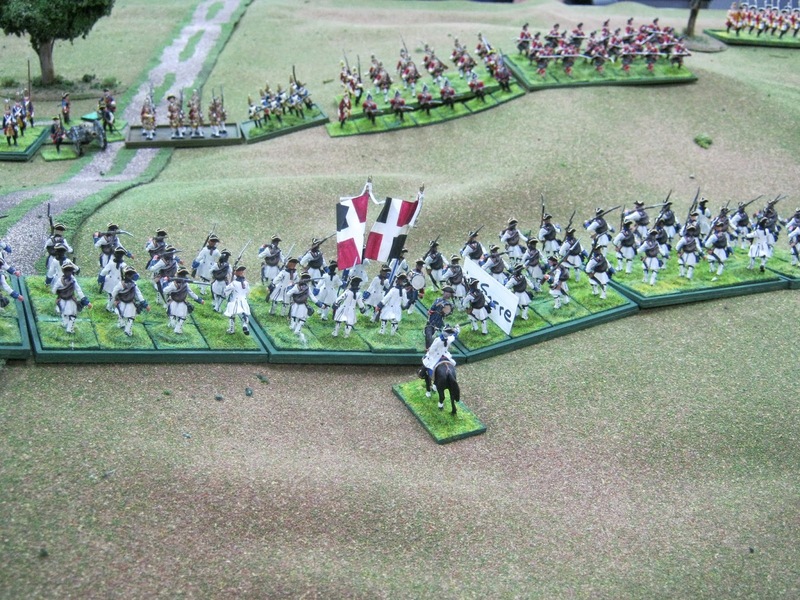 Two French units of the second line. Infanterie Battalion 2/Guyenne and leading horsemen of the Royal Horse Régiment. Guyenne has sixty hommes. The Royals have thirty-six cavaliers. Guyenne are old Front Rank whist the Royals are Ted Surens armed with pin swords. They can really draw blood - and have! Suren swords were bendy - very bendy. One of our pards, Keith L., told me to do what the celebrated Peter Gilder did. Replace bendy swords with pins. So I did. It would not do to have the Ted Suren Royals armed with swords that would eventually resemble curly tails of um -- pigs. Poor form you see. One must be careful around the Royals. What Did The Royals Do Next? Late in the game they rode forward in two columns protected for a time by the Arquibusiers de Grassin. Auvergne is beyond that big central tree. The Royals wanted to get behind von Bungle on the right of the photo but only AFTER the latter loosed its powerful first volley; (+5 in BAR). Otherwise, well, you know, poor form for cavalry. 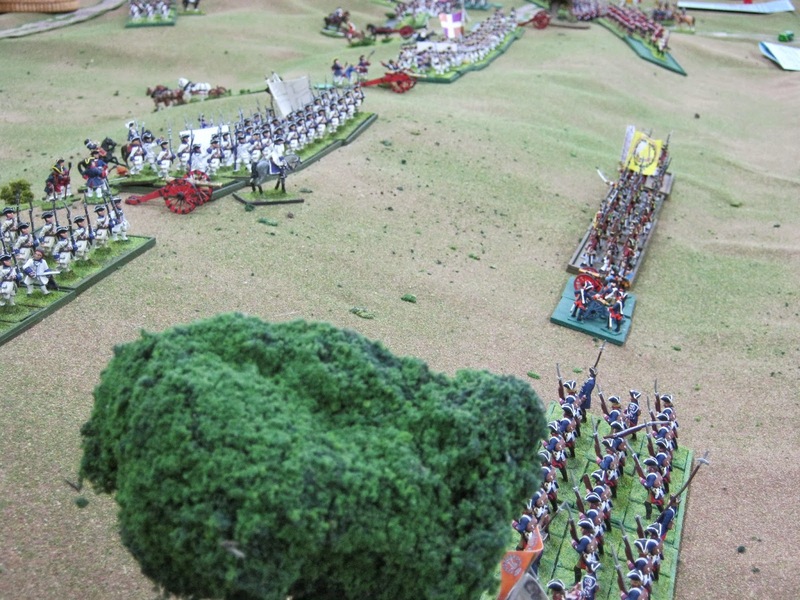 The near squadron rode onto the Allied Back Table off image to the far right, sabered some artillery crews there and then turned around to hit von Bungle in the rear as the other Royals hit von Bungle from the front. 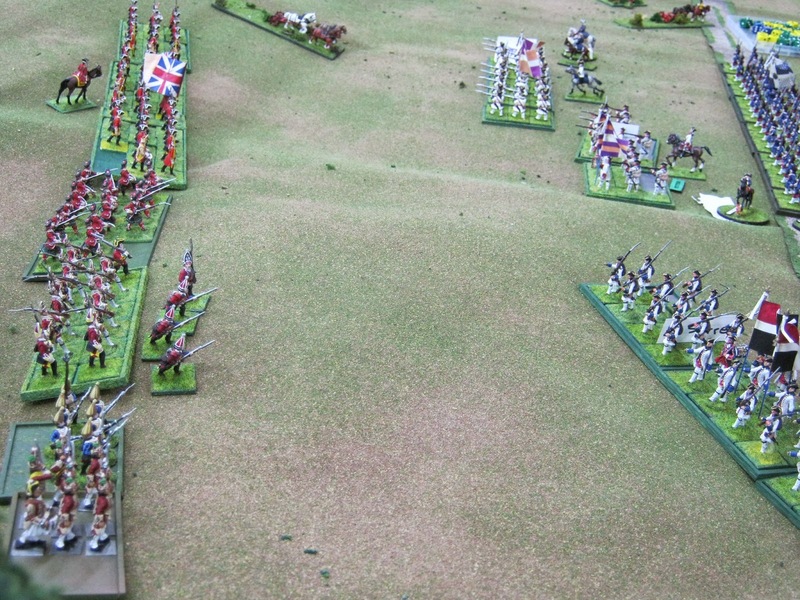 The French won the contest and secured their right flank. 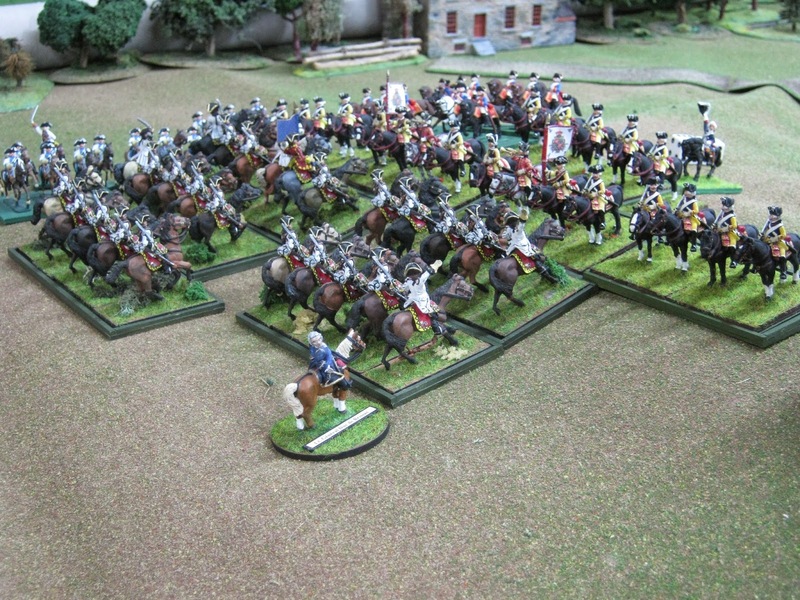 The Hanoverian Guard Horse (red) will soon charge into the flank of 2/Berry. The latter will tumble backwards. 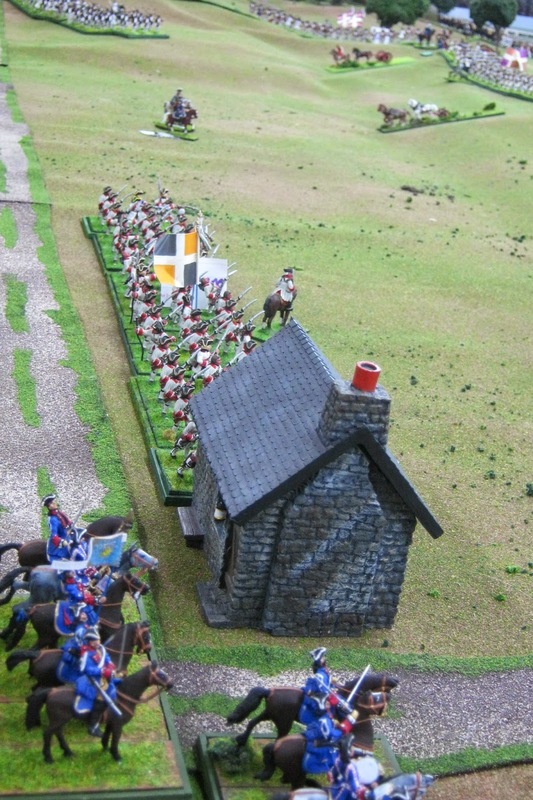 On the rise of ground von Bremer's Horse move forward with the Brunswick Karabineers. Oh! There's Luckner's Hussars behind them with three attached von Stockhausen Lancers. 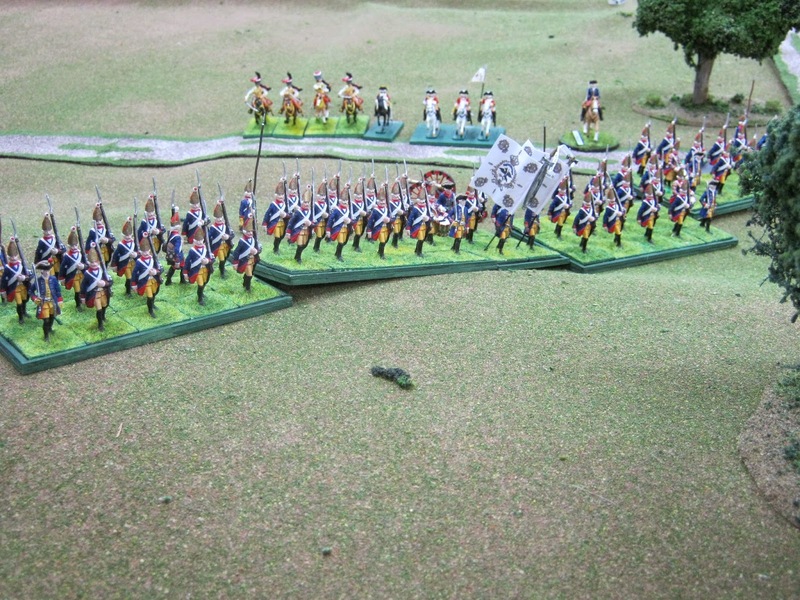 Behind the Karabineers is the Hessian Leib Regiment. Near the stone house are von Breidenbach's Dragoons. The Protzdammers continue to march forward - stately - for a coup de grace. There's a song about that Regiment. For those who know the verses, the song applied once more. Kurt, please sing it for us. 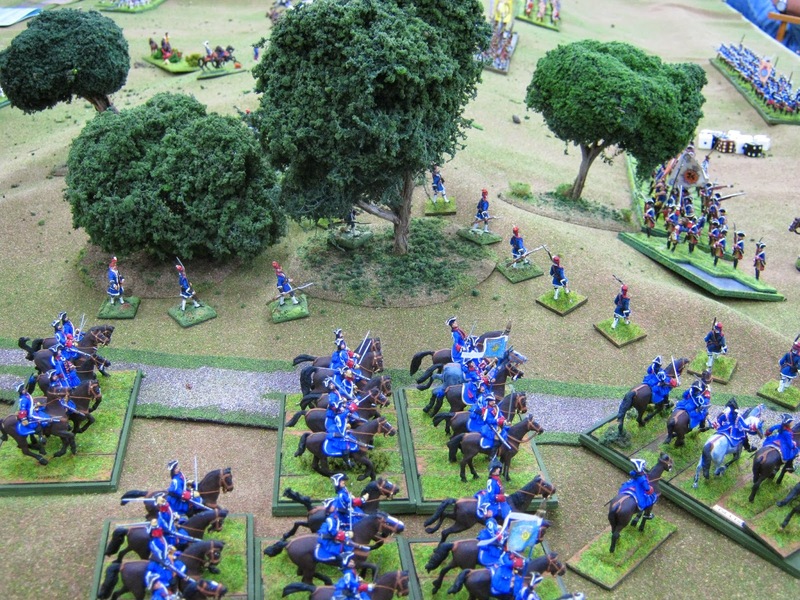 The French Royal Carabiniers engage the Allies. They probably are not watching the Karabineers engage the French Commissaire Générals in the far upper right. That's 2/Berry's unmanned 4 Pounder battalion gun. 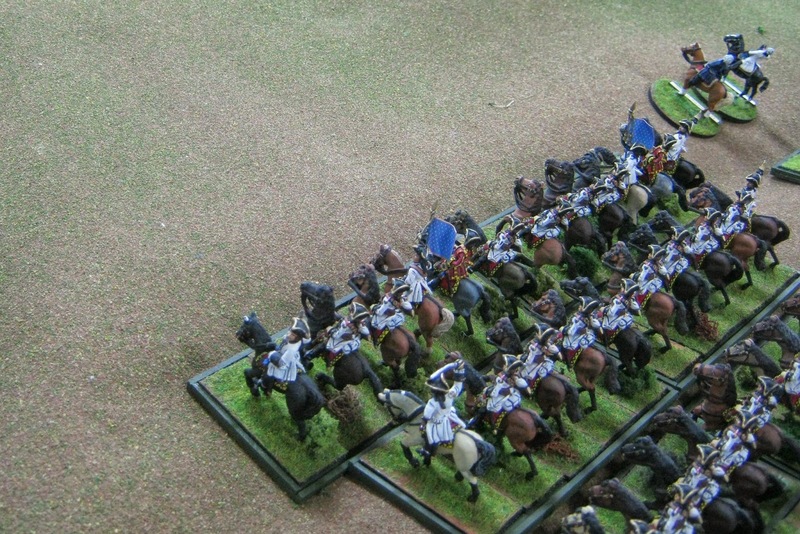 Engages my Commissaire Générals in front and flank. I should have reduced my ranks from three to two to cover more ground as was common in this era when outnumbered. This would have made being flanked less probable. Also had flank troubles. Bill, why did you forget your formation tactics today? 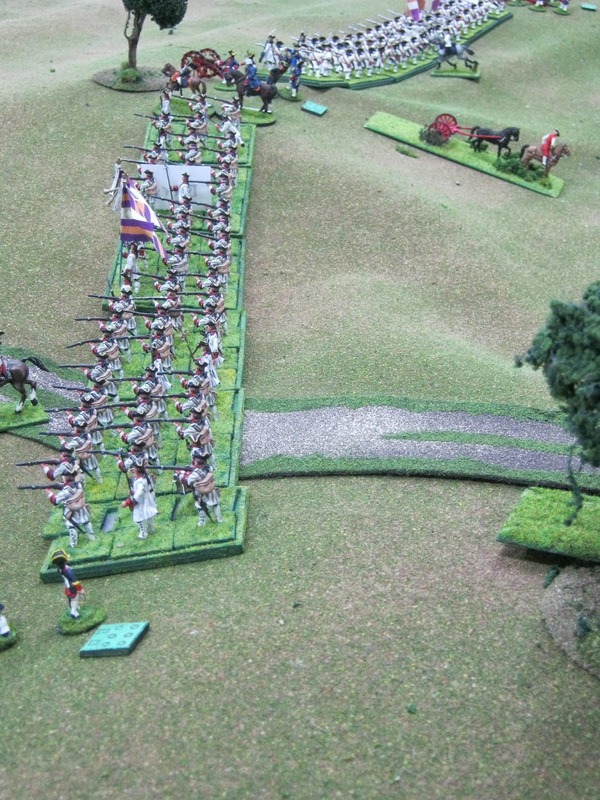 Commissaire Général was defeated, routed and pursued to the French Back Table. 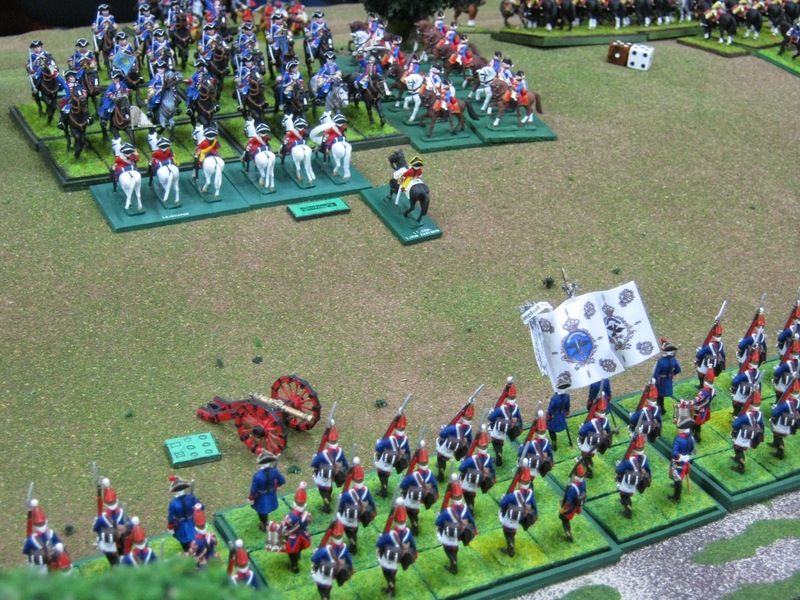 The Royal Carabiniers won their mêlée and pursued their opponents. The latter routed through the Protzdammers disorganizing them. All Right!!! Behind the Protzdammers after both reorganized later. 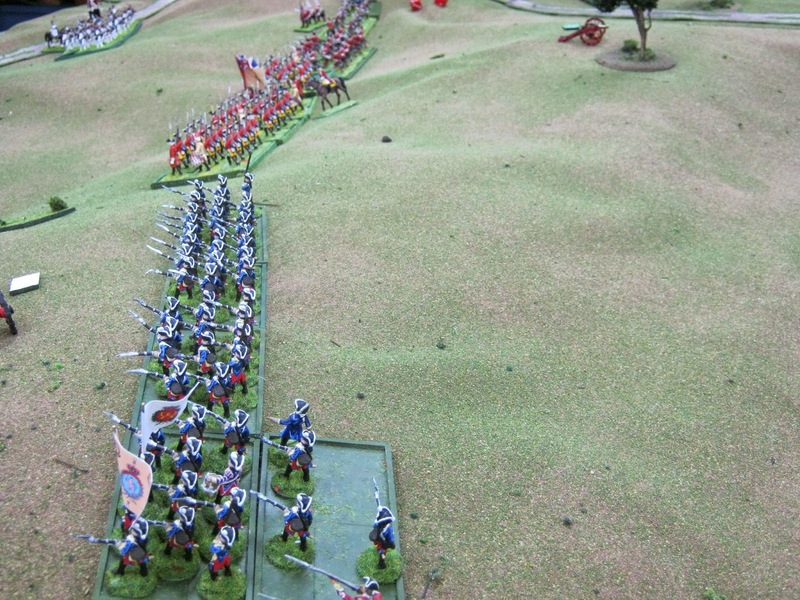 However, with the Commissaire Générals gone, the Carabiniers retreated to cover the infantry of the French Left Flank who are off image far far to the lower right. 2/LaSarre observes Allied Converged Grenadiers approach. 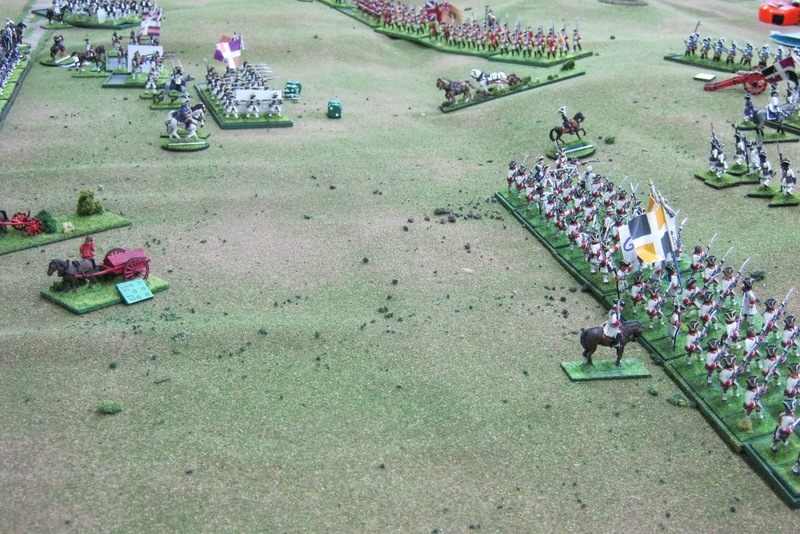 La Sarre has no left flank due to the defeat of the French cavalry. More Allied infantry comes forward; my 30mm Stadden 44th Foot. These go way back to when I published the F&I rules Drums of War Along The Mohawk in the early 1980s. Copies still available too! Allied infantry marches inexorably forward. 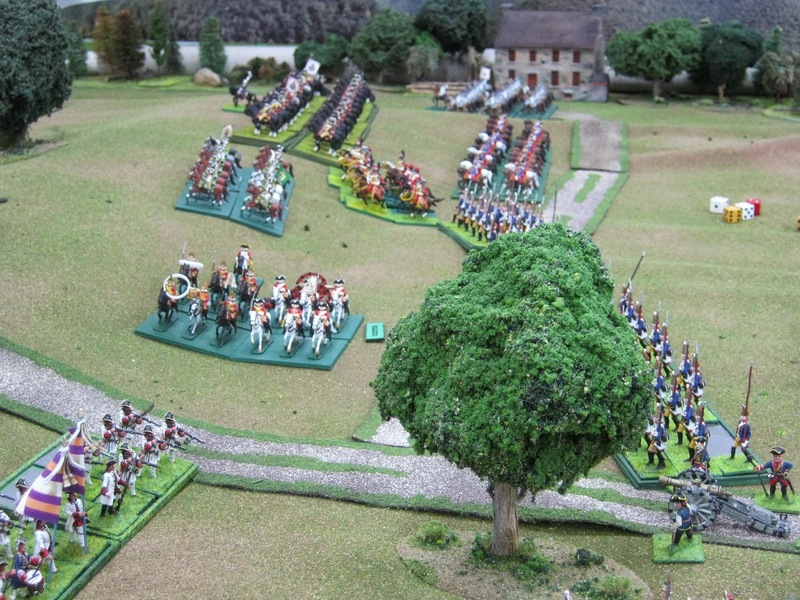 The French have brought forward one of two battalions of Grenadiers de France seen in the upper right. 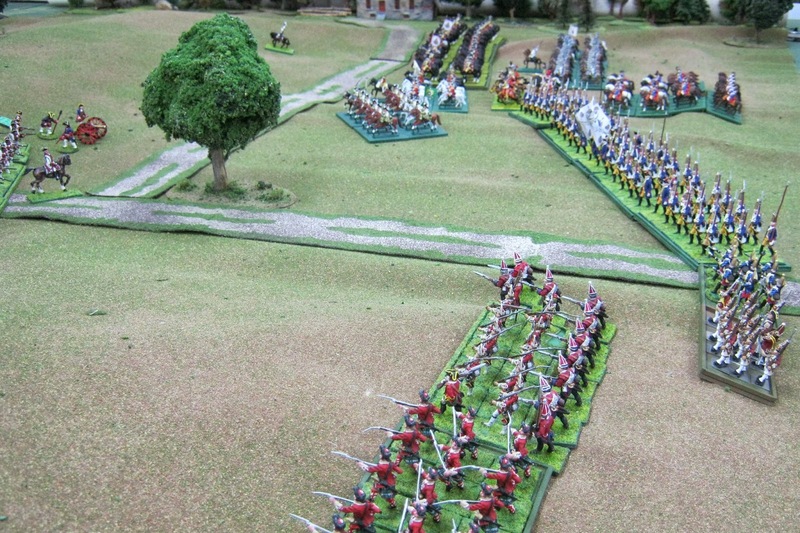 Brunswick Battalion Isenburg (25mm Garrisons) moves forward to the left of the 44th Foot. The French are withdrawing. They needed to. Congratulations to all for a companionable game with a lot of back and forth tactics, surprises, good chow and laughs. We've got a great bunch of guys in our group and I appreciate it. Seated left to right: Chuck L., John B. and Rob O. Standing left to right: John M., Joe G. and yours truly Bill P.
1) We drew cards to move by side. Red Allies and Black French. However, we fired simultaneously on this occasion. No cards. BAR is flexible that way. It worked. 2) Next game? It's scheduled for Saturday August 9, 2014 in cold and desolate East Prussia. The Russians are coming. The Russians are coming. 3) I wonder. Should the French pull back to their magazine at Frankfurt Am Main? If defeated there, could the Allies cross the Rhine! Never. This story is quite a departure for me and I hope you take a look and enjoy it. 5) Thank you for looking in. 6) Comments welcome below. We would all appreciate hearing from you. For those who are waiting for another General Pettygree Colonial story, he'll be back in August 1903/2014. 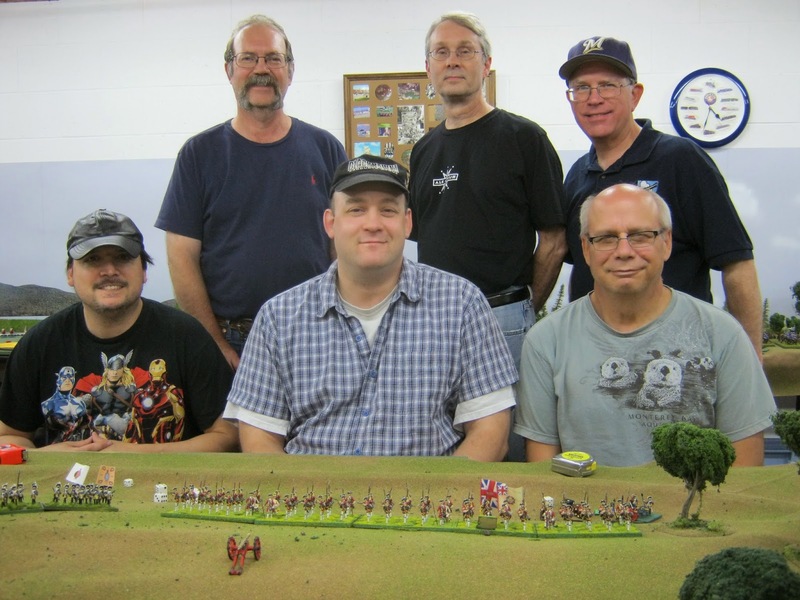 In a few days I'll post photos and the usual AAR about our latest SYW battle which occurred July 19, 2014. Come back soon for this. Imagine the South Pacific between WWI and WWII. Naval Action, Shore Parties, Seaplanes, Heroes, Villains, Pulp, Adventure, Science, Science Fiction, Indigenous People/Animals all in tropical settings. Stories advance by briefly captioned photos of locations I've visited accentuated with historical miniatures on our tabletops. This will be different than anything before. I hope you enjoy reading and viewing our images. Thank you in advance.